It's no secret that since the Dark Millennium Online followed Dawn of War and Space Marine sequels into oblivion, the fate of 40k-related videogames doesn't look so good. Games Workshop has licensed a lot of low-budget games, but its usually hard to look at them without crying. 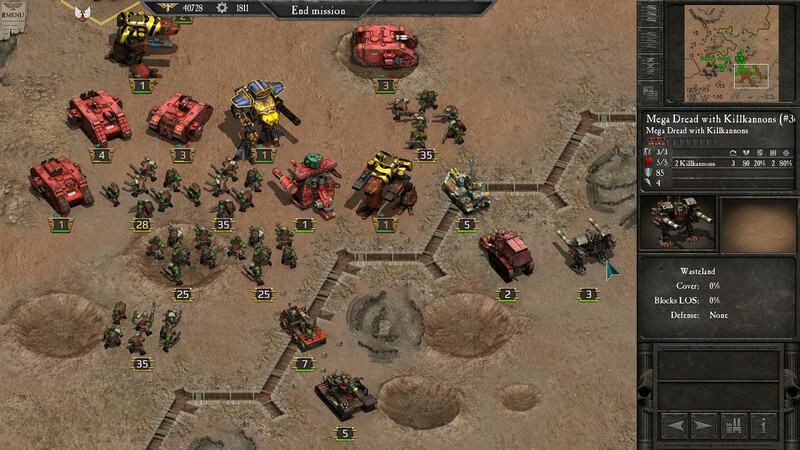 However, amongst the casual mobile games one stands out - Warhammer 40000: Armageddon. I've always thought that with limitations imposed by mobile platforms and a low budget to work with it's a much better idea to make an old school game as opposed to an oversimplified two-button arcade, so I've taken an interest in this project the first time I've heard of it. However, this game is obviously not a cutting edge one, so if you can't stand isometric graphics or turn-based gameplay, you better pass on this one. And everybody else - take on your hipster glasses and let's take a walk down the nostalgia lane. 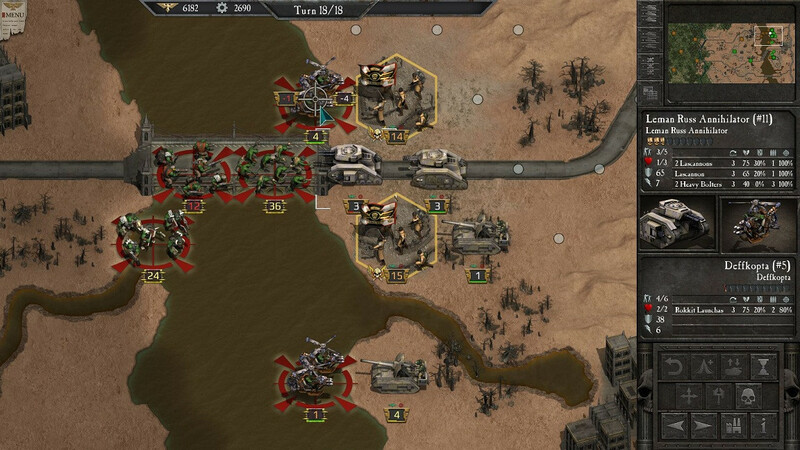 Gameplay-wise Armageddon is a 40k-themed remake of a classic turn-based hex-based strategy game Panzer General. 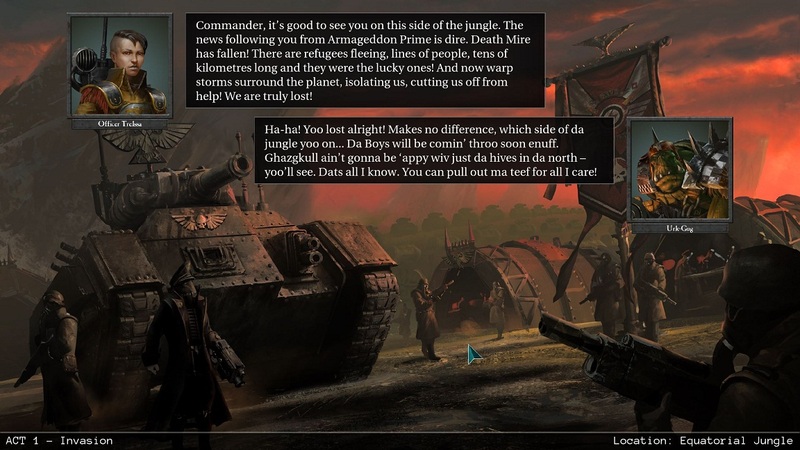 Long-time 40k fans may find it similar to games like Rites of War and Final Liberation. The game takes place on maps divided into hexes, in each of which a unit may be located. Those units move and attack one after another (each attack also evokes the defender's counter attack, provided his weapon is as long-ranged as the attacker's is), and then the turn is passed on to the opponent. 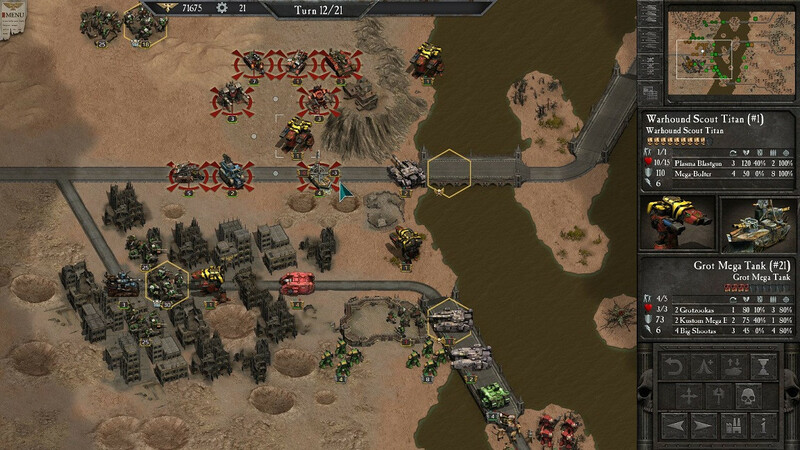 The terrain scattered on the map limits the movement of certain units (vehicles can't enter buildings, and water features are impassible to everything but Titans and aircraft, for example) or slows them down. It also limits their vision, making it harder or even impossible for them to hit their targets. Scenario objective is usually to a capture certain victory hexes, although sometimes the player is required to fight his way to the other side of the map through the enemy forces, defend his positions for a certain amount of time, or to complete some other specific tasks. The number of turns is always limited, so you can rarely just take your time you need. All in all, game mechanic is pretty simple and easy to understand. You can have a closer look at it in an official game manual. All units that live long enough to to see the end of the scenario will follow you to the next one, restored to their original numbers and gaining some experience in the process. 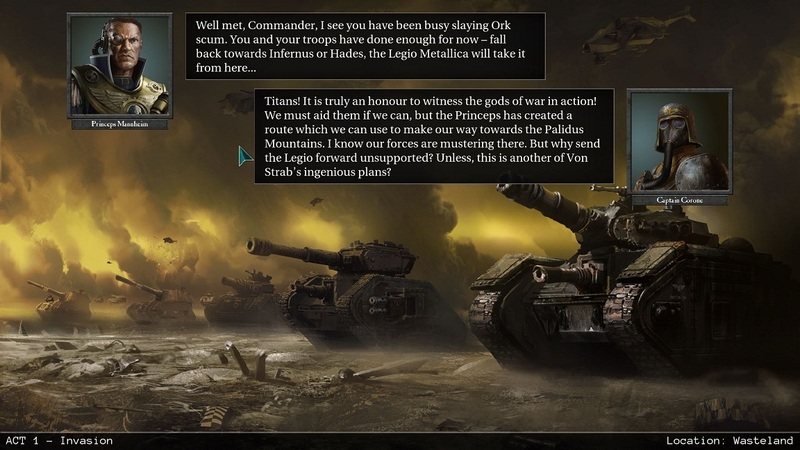 At the start of each scenario you can also buy new units or upgrade old ones - infantry squad may raised to the command squad, while a basic Leman Russ may be turned into a Punisher. More powerful units are gradually unlocked as you proceed through the storyline. There is actually a lot of them in the game: most are taken right from the tabletop (including a lot of forgeworld ones), and some are original, like Armageddon planetary defence forces, suicide bombers and gangers. 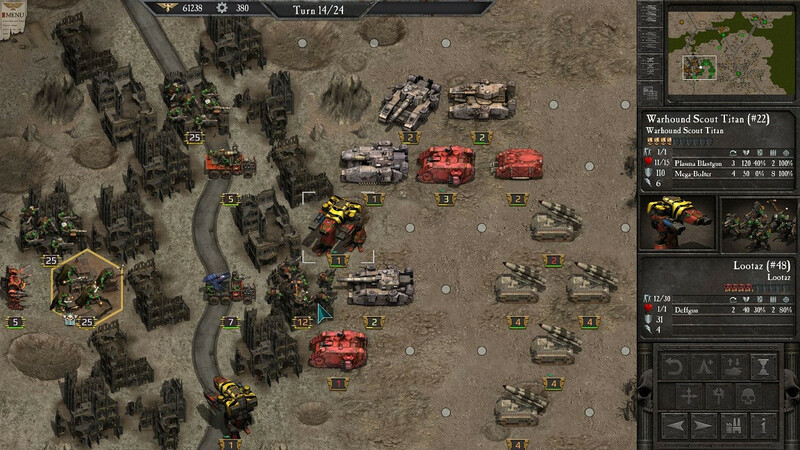 However, despite the wild amount of units, the system was definitely designed with huge tank battles in mind, and because of it, in most scenarios infantry's only role is to capture the victory hexes inaccessible to vehicles. Aircraft units are also pretty strangely done and don't see much use. 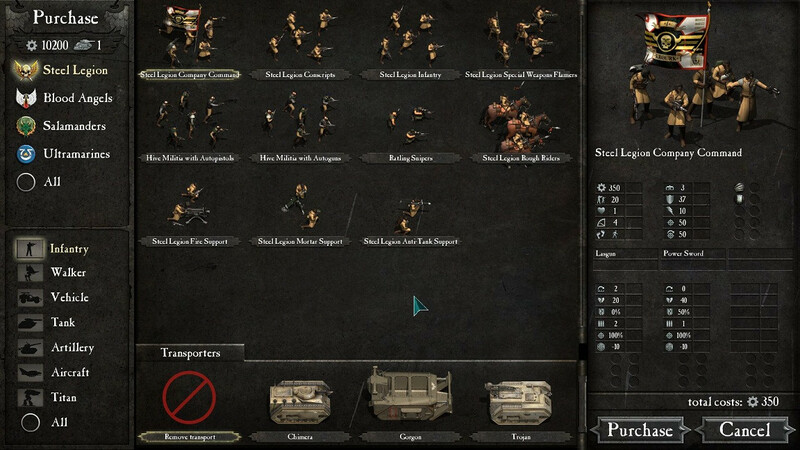 On the brighter side, all weapons on all units are taken right from the tabletop and adapted to the game's mechanic. One unit may have up to three weapons and fire them at once. Those might have different damage, armour piercing and range. It's actually nice that a unit's capabilities are not just given as an abstract numbers, but are a direct consequence of its weaponry. 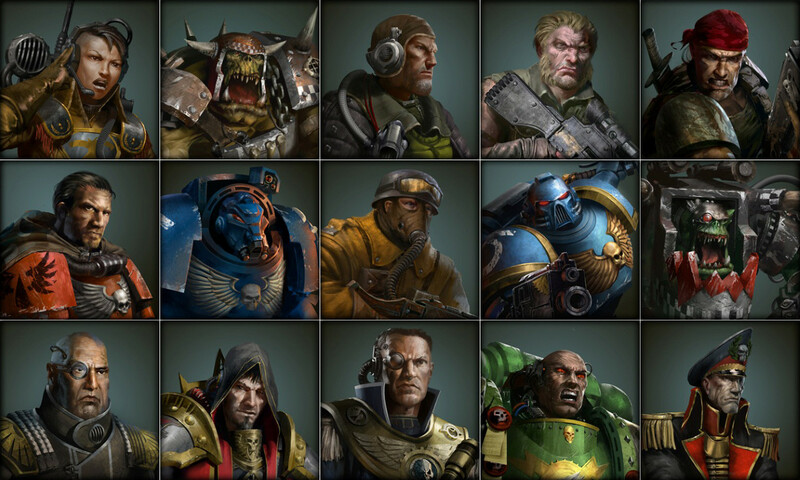 Available factions include the Imperial Guard (that is represented by Armageddon Steel Legion, units from other homeworlds such as Cadians, and several other units, from armed civilians to Titans), Orks and Space Marines. The last is represented by three chapters - Blood Angels, Salamanders and Ultramarines. Most of their units are the clones of each other and differ only in colour, although there are differences, for example the Angels lack the centurions. Each of the chapters also has a unique unit or two such as death company or Chapter Masters Tu'Shan and Dante. Game uses isometric graphics. And that really all you have to know - those who are OK with this will have no complains, while modern players will probably run like hell at this point. 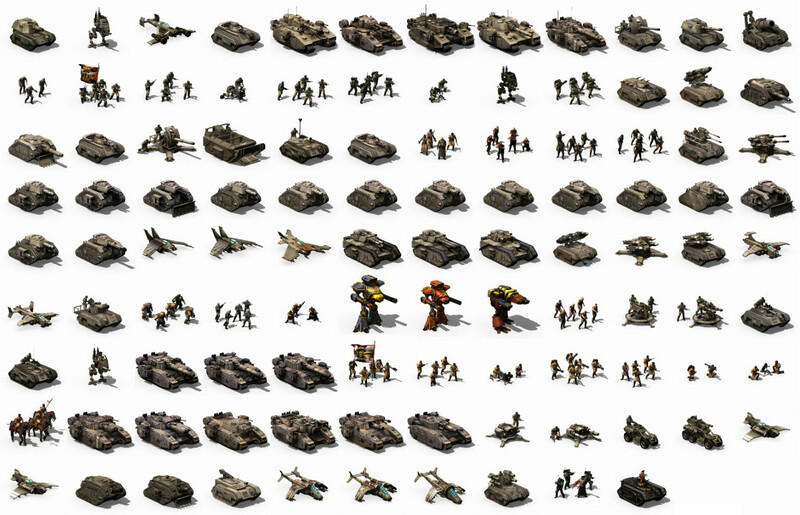 Personally, I rather like how the game looks on the screenshots - all units are recognisable, varied and look pretty nice. However, in the game itself they don't look as good - with the exceptions of fire and explosion effects (which, admittedly, look very impressive), the game has no animations at all, which leaves a pretty bad impression. So, in the end, the game doesn't really deliver to PC's standards, but I think it will look much better on iPads once it gets there. Maps look more or less the same as units, although the lack of animations doesn't hurt them as bad. There aren't that many types of hexes for their creation, but the developers have made an admittedly good job putting them into maps. In the course of the campaign we'll get to fight in destroyed towns, mountain peaks, blood-red rivers, lifeless wastelands, thick equatorial jungle and even in the depths of the hives, so in the end Armageddon remains the lifeless hive world it is supposed to be, but despite the limited amount of hexes, maps look varied enough. Along with the game comes a map designer program, allowing the players to test their world creation skills. Sound effects are nothing much, but there are nothing to complain about either - lasers zzap, shells explode and walkers make appropriate hydraulics noises. Dialogues between scenarios are nicely voice acted, even though the actors don't seem to be very passionate. And as for the music themes - there are only four of them and they are just your generic heroic music, so I turned it off pretty quickly in favour of listening to something of my own while playing. 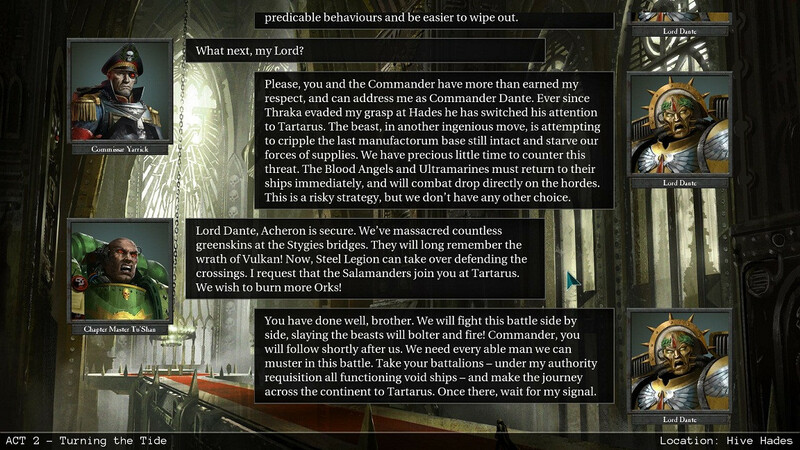 Offline part of the game consists of four campaigns, which contain a total of 35 scenarios, of which first five form a tutorial campaign, and another ten come in pairs. You'll get to play only one scenario in each pair, depending on the choice you make in the process of the campaign. But all scenarios can be launched from the main menu, so if you wan to play every single one, you won't have to replay the game all over again. At the beginning of the campaign you have an option of five difficulty levels.You can also choose to have the options of turning fog of war and the ability to undo the last move on or off. To sum it all up, I'll admit the the game has its shortcomings even beyond the ones resulting from its understandably low budget. But it can offer a lot of interesting content as well, and I'm sure it will find its audience. I had a lot of fun playing it to from beginning to end - I might post a quick walkthrough some time later. I'm actually curious to see what kind of sequel Slitherine might offer to us in the future since they supposedly have a three-year plan with GW and they are about to make more games using GW's IP. 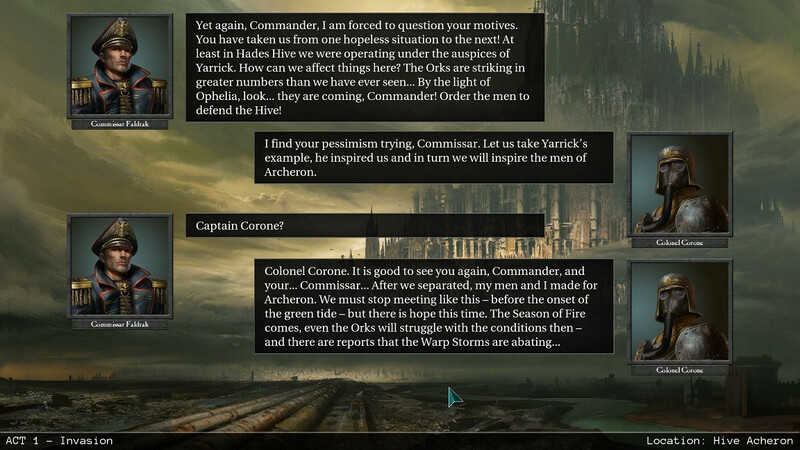 The game already has almost everything developers need to make a campaign covering the events of a Third Armageddon War, and with extra effort we can see a lot of scenarios made on the basis of this game. We'll see about that in the future. 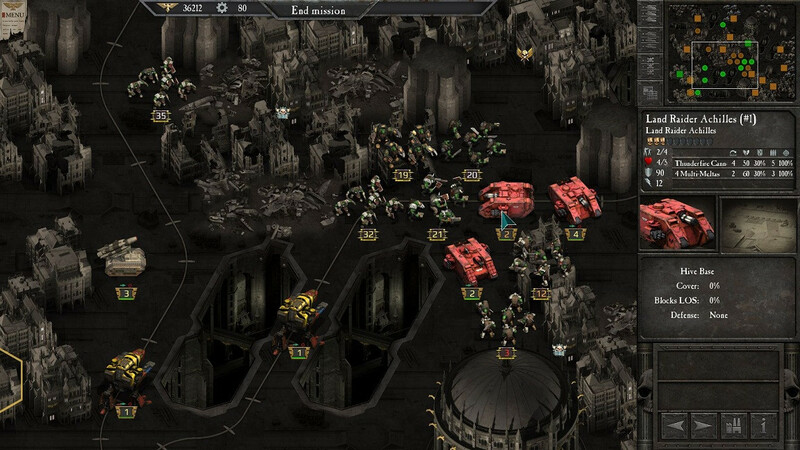 And for now Warhammer 40000: Armageddon is already available on Steam and is expected to hit iPads in half a year. Content on this blog is licensed under a CC BY-NC-SA 4.0 International License. 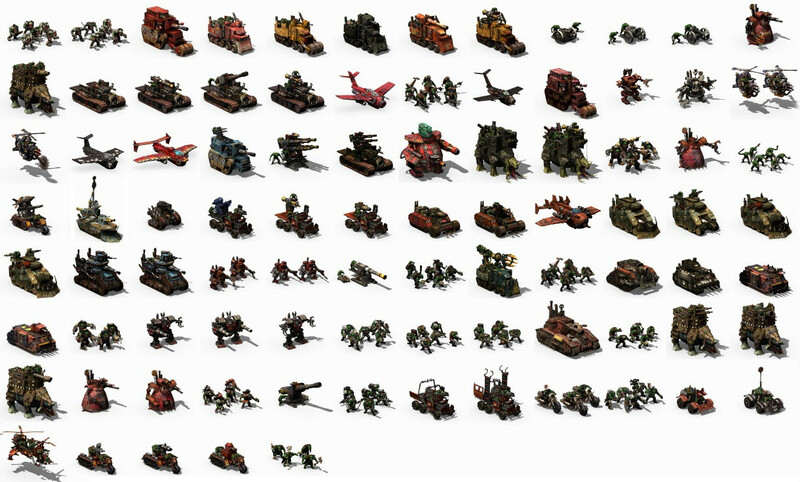 All rights to Warhammer 40k universe belong to Games Workshop Ltd 2000-2020.